Chanteur Rockabilly US né Robert W. Siscole 24 Août 1932 à Bolivar (Tennessee). 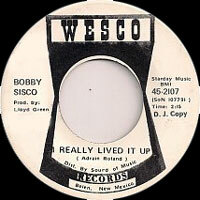 Bobby Sisco a débuté en 1955 chez Mar-Vel Records, un label de l'Indiana. On le retrouvera en 1957, à Chicago, chez Chess Records. Il est décédé le 17 Juillet 2005 à Munster (Indiana). 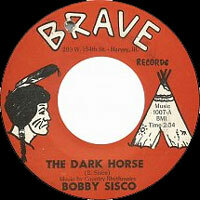 Bobby Sisco attended Central High School in Bolivar and graduated alongside his close friend Ramsey Kearney, the singer who cut "Rock the Bop" on Jaxon and co-wrote "Emotions" for Brenda Lee. The family, including two sisters, listened to the Grand Ole Opry on Saturday nights and Sisco's mother taught him how to play guitar. 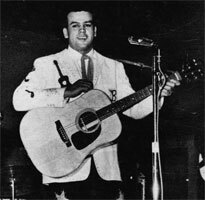 In 1948, Sisco the Singing Farmboy hustled up his own sponsors for two slots on radio WTJS in Jackson, Tennessee, By 1949 he was playing in Jackson's rawest honky-tonks with Carl Perkins and his brothers. Shows on the more powerful WDXI increased Sisco's exposure but when his father quit the farm Sisco followed his parents to Calumet, Michigan and found the atmospheric "Sin City" nightclub scene to his liking. 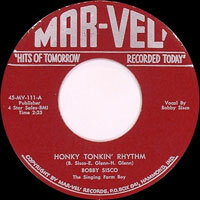 Uncle John Ellis, the premier DJ on WJOB in Hammond, Indiana, introduced Sisco to Mar-Vel Records owner, Harry Glenn, and in 1955 Sisco cut "Honky Tonkin' Rhythm" (Mar-Vel 111) at Chicago's Universal Studios. Bill McCall of 4-Star helped finance the session in return for the publishing rights. The record did well in the mid-West and Sisco made personal appearances with Johnny Cash, George Jones and Little Jimmy Dickens. Sisco made contact with Leonard Chess in 1956. "Rockabilly had started coming in strong and I was gonna get in on the trend like everybody else. I set up an interview with Chess and they were all enthused. They wanted to make another Bill Haley out of me. They had big plans. I only had 'Tall, Dark and Handsome Man' and they told me ' Well go home and write three more songs and we'll do our first session.' I had kinda got baffled and didn't come up with anything I really liked except 'Go, Go, Go' which I liked real well. So I wrote that and they said ' Well come on down. We need to get something out.' They set up the studio time at Universal and they furnished the musicians except Johnny Hammers who was my lead guitar player. He was working with me on my road tours and my nightclub shows. He knew my material and fitted in with that twangy rock guitar so they let him play on my session. I worked harder on that session that any session I've ever been in. I worked until I was completely exhausted. And we got two sides cut." Leonard Chess signed Sisco to a one-year contract with a one-year option, but his tenure at Chess was very short-lived. 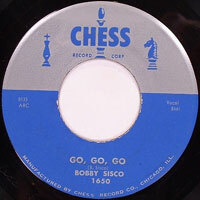 According to Sisco, someone told him that Chess had given his song ("Tall, Dark and Handsome Man") to Chuck Berry. "I didn't pay attention and thought for sure they'd let him have my song and hadn't released mine. I got very upset and we had a very serious argument. They finally released my record but they nullified my contract." Harry Glenn tried to rectify matters but Leonard Chess said he wouldn't lift a finger to help Sisco who had cussed him out and called him a lot of bad names. "I thought they'd stolen my song" said Sisco whose informant had confused "Tall, Dark and Handsome Man" with Chuck Berry's "Brown Eyed Handsome Man". "Anyway", added Sisco, "I shouldn't have done what I done." Following his disassociation from Chess, Sisco pitched a couple of Nashville-recorded masters to Vee-Jay Records. 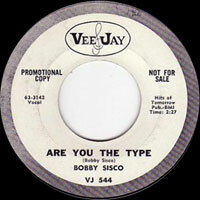 The band on "Are You the Type" (Vee-Jay 544) included Floyd Cramer, Grady Martin and Buddy Harman. He also recorded several fine C&W songs for Harry Glenn's Glenn label during the same period and, in the mid-1960s, he fetched up on Brave, a company owned by Marvin Rainwater and Bill Guess. Sisco helped to write "The Old Gang's Gone" recorded by Marvin Rainwater and Lefty Frizzell. 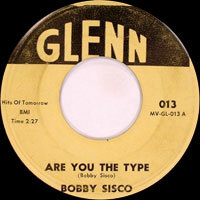 During the 1970's Sisco headed his own company, Wesco, and made a slew of singles for that imprint. He promoted "Long Shaggy Hair" (Wesco 2107) on a show with Buford Pusser whose life story, "Walking Tall", was filmed among the clubs and bars in Jackson where Sisco had played as a teenager.